Odessa, a city of Russia, in the government of Kherson, on the shore of a bay in the N. W. part of the Black sea, between the mouths of the rivers Dniester and Dnieper, 90 m. W. by S. of Kherson, and 385 m. N. N. E. of Constantinople; lat. 46°- 29' N, lon. 30° 44' E.; pop. in 1867, 121,335, including many Greeks, Armenians, Jews, and Italians. It is the seat of the governor general of New Russia and Bessarabia, and of a Greek archbishop. The town stands on a broad plateau, to which it descends almost perpendicularly, and communicates with the beach by a wide stairway of 200 steps. On the edge of the plateau extends a boulevard lined with handsome buildings, and adorned with monuments. In the rear the plateau spreads out into vast steppes almost destitute of vegetation, from which in summer dense clouds of dust are blown. The streets are wide, laid out at right angles, and macadamized, and there are several squares well planted with trees. 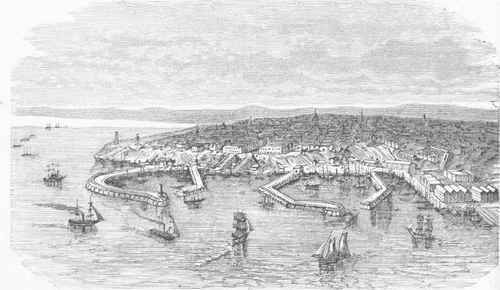 The town is defended by a fort at the S. E. extremity, and by several batteries along the shore; and the ground between the town and the harbor is occupied by barracks. The anchorage is good, and an inner harbor capable of accommodating 300 vessels at the quays has been formed by two moles. The port is generally closed by ice two months of the year. The prosperity of Odessa as the principal grain-exporting port of the Black sea has been lately much increased by railway communication with Moscow and St. Petersburg, and by numerous steamboat lines. Since the close of 1873 the city has been supplied with water pumped from the Dniester by powerful works 26 in. distant. The city contains a fine cathedral, 31 churches and 12 synagogues, several hospitals and theatres, an archaeological museum, and a university founded in 1865, which in 1874 had 39 instructors and 257 students. There are about 500 granaries. The number of vessels that arrived in 1872 was 1,253, tonnage 722,979; cleared, 1,286, tonnage 752,816. The trade is mainly in grain, tallow, timber, and wool. In 1872 the exports were valued at $34,360,000, of which $25,580,000 was in wheat. The value of imports for the year was $40,720,000. - In 1792 Catharine II. selected the site of Odessa, and the town was founded in 1794, several regiments being employed in constructing public works. Alexander I. continued the work, Odessa improving chiefly during the governorship of the duke of Richelieu, to whom a monument has been erected. The same czar in 1817 declared the town a free port for 30 years.